An idea ? A project ? 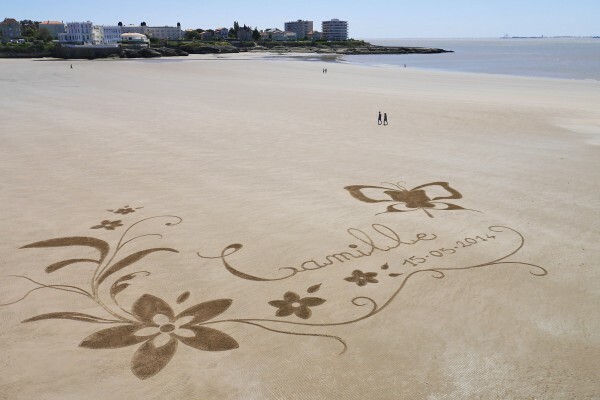 You do not might imagine, but beach art can have many applications! To date, I have completed numerous projects both for individuals, for businesses, through associations, recreation centers, colleges, high schools or hospitals. You want to celebrate an event and leave an indelible memory of it or perhaps would you like to communicate grand and original way. In this case, I invite you to go below the different options available to you to set up your beach art project. Beyond drawing on the beach, my skills and experience in the field of multimedia allow me to offer complete packages ranging from shooting photos or videos to the image processing. Depending on the nature of your project and your needs, I propose seamlessly opportunities available to you, including involving my professional network in image shooting and processing if the need is felt. Finally, if you have other innovative ideas, which are not listed below, do not wait any longer and contact me ! Before contacting me for a project, I suggest you to read the questions / answers below. This will allow us to save time on the logistics or organization and to better concentrate on the creative part. Can we make beach art on any beach ? The beach art is practiced on the wet sand, or at low tide. This assumes that the beach is a great foreshore enough to draw. It is for example not the case in the Mediterranean Sea which is only slightly subject to the tidal range. How long does it take to draw a work? The average completion time of an beach art is 3 hours. Low tide allows till 4 or 5 hours drawing using the coefficients of the tides. I usually start drawing 2 hours before the tide is completely down. 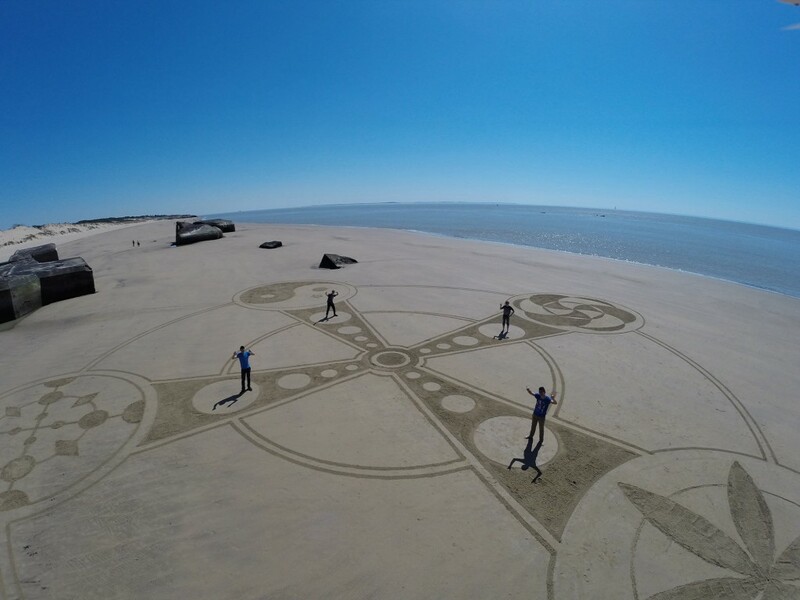 At what time of day do you play beach art? As mentioned in previous issues, beach art is practiced at low tide. The time of day conducive to drawing on the sand is dictated by the tide. The idea is to start at best about 2 hours before low tide. 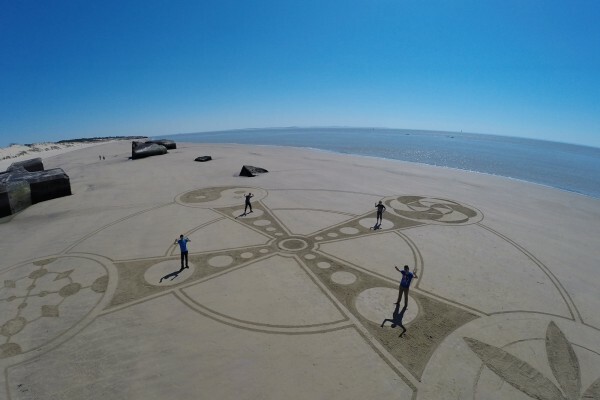 Can we play beach art on any sand? It is best to have a very fine sand to the contrast of the drawing is clearly visible and that it fits on the length. Indeed, a too coarse sand will tend to dry faster, so we quickly loses the drawing. Is only tide able to erase the drawing? As explained a little earlier, sand density is important. Too coarse sand will dry too quickly and does not allow you to have the contrast to form the design. But that’s not all ! The wind and sun are also elements that dry sand. Dry sand becomes volatile and the drawing disappears in the wind. Can we do all types of designs? I do not really impose myself limits, if not sometimes those of ethics. 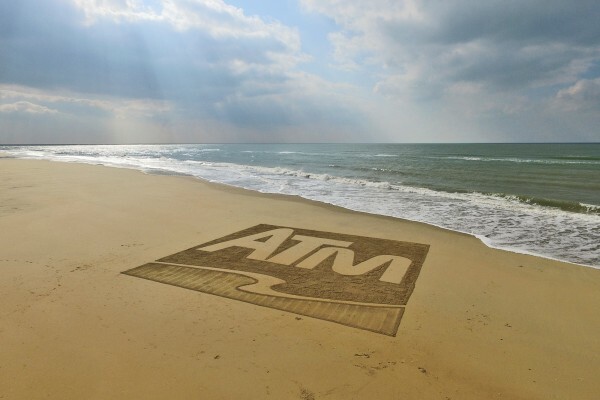 However, be aware that the beach art can work as monochrome shades, the panel shades are also limited. It is best to present your project to me, so that I can check the feasibility. 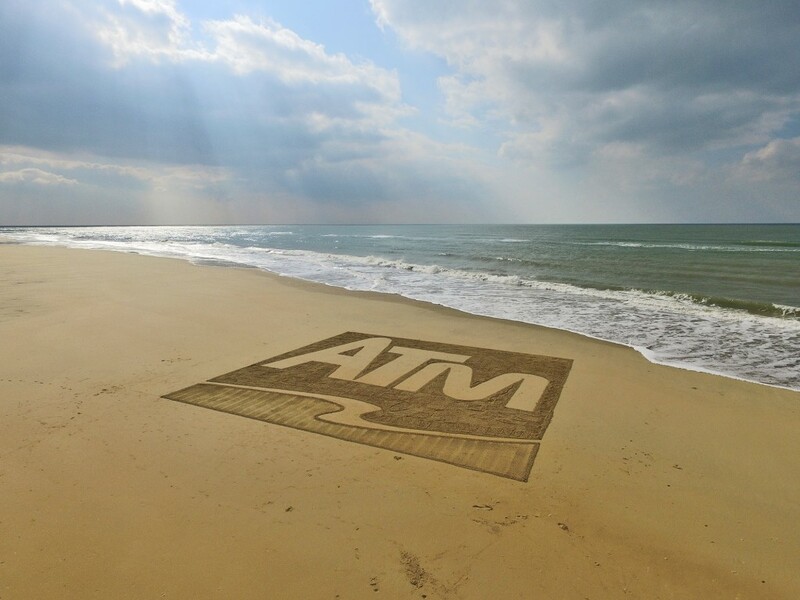 The beach art can cover relatively large floor areas. The idea to make all his grace to the drawing on the sand is to photograph or film from the sky. I can make aerial photos and videos using a drone, within the limits of the rules imposed on unmanned aircraft flights. We must therefore ensure that the desired area allows the flight. You can also use your own provider if necessary. 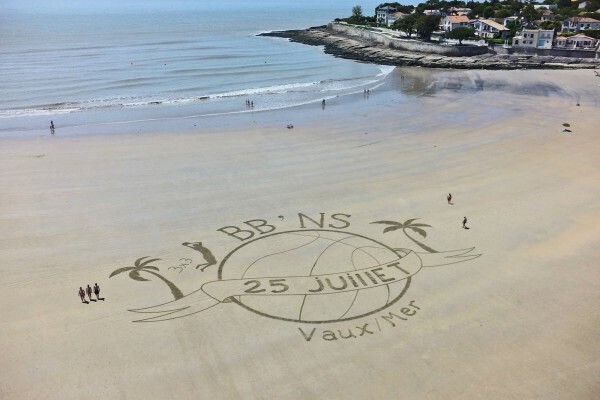 The beach art can be the key to successful communication operation by scoring high spirits! Logo, slogan, custom drawing, I accompany you in your project to show your customers that you see it big! 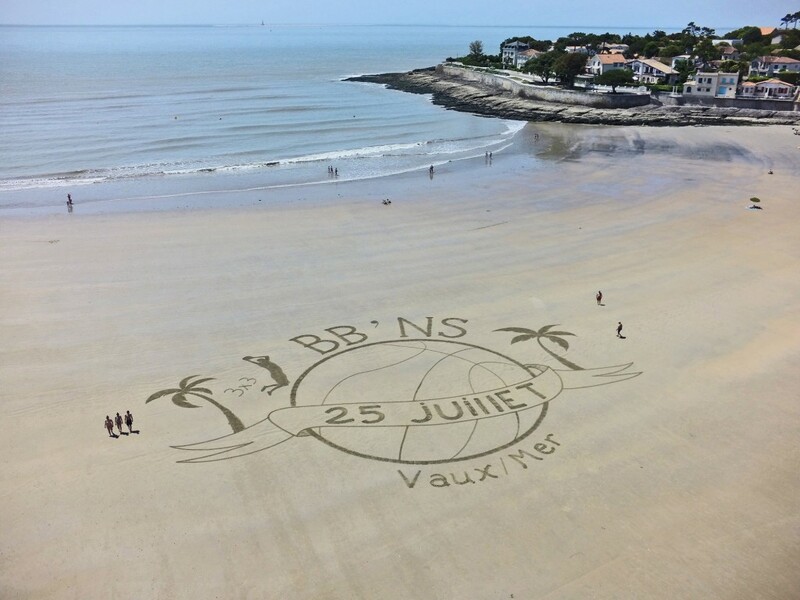 You are an association, a town hall, a business and you want to announce an event, beach art can be a shock strength in your communication asset. You need an unusual animation ? I can draw live for your event on the theme of your choice. The people there will then be lulled by the soothing music of the ocean and enjoy the making of a A to Z drawing in the sand. You can also benefit from my media aura. Associations, schools, colleges, recreation centers or hospitals, I offer workshops for discovery and introduction to beach art. We can achieve a collective work or work in small groups at a workshop on which I accompany you to learn how to use the tools, but also to design in space. For businesses, make your seminars a success thanks to a beach art workshop, where your employees can work on group cohesion while having fun on the creation of an ephemeral work. 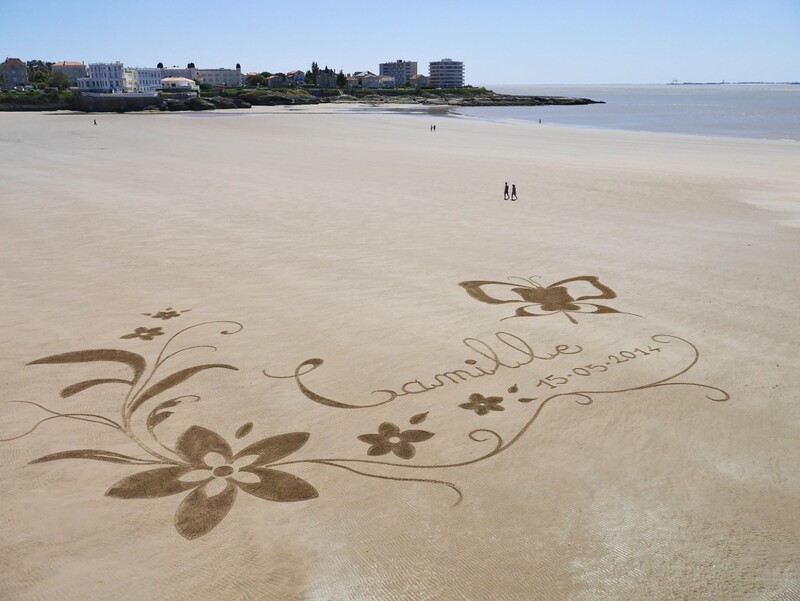 You want to celebrate a milestone in your life, beach art allows you to burn this unique moment thanks to a dedicated work! If you wish, you can also put you in position among the drawing to capture the moment with your family or friends. Nothing better to make a single picture! Error: Error validating access token: Session has expired on Monday, 05-Nov-18 05:38:02 PST. The current time is Monday, 22-Apr-19 02:02:37 PDT.